The other weekend, at an annual gathering called the Pop Conference, I gave a presentation called Budweiser Bought My Baby, which used my own experiences licensing music to sponsors to investigate the way indie bands’ and fans’ attitudes toward commercials have transformed over the last 30 years. By popular demand (where “popular” = “2 people asked me”), I’m posting that presentation here. What follows is my own personal take — the other band members probably have their own opinions. Tim and Jay will be appearing at a Dear New Orleans benefit concert at the Black Cat in Washington, DC on Monday, October 4th. 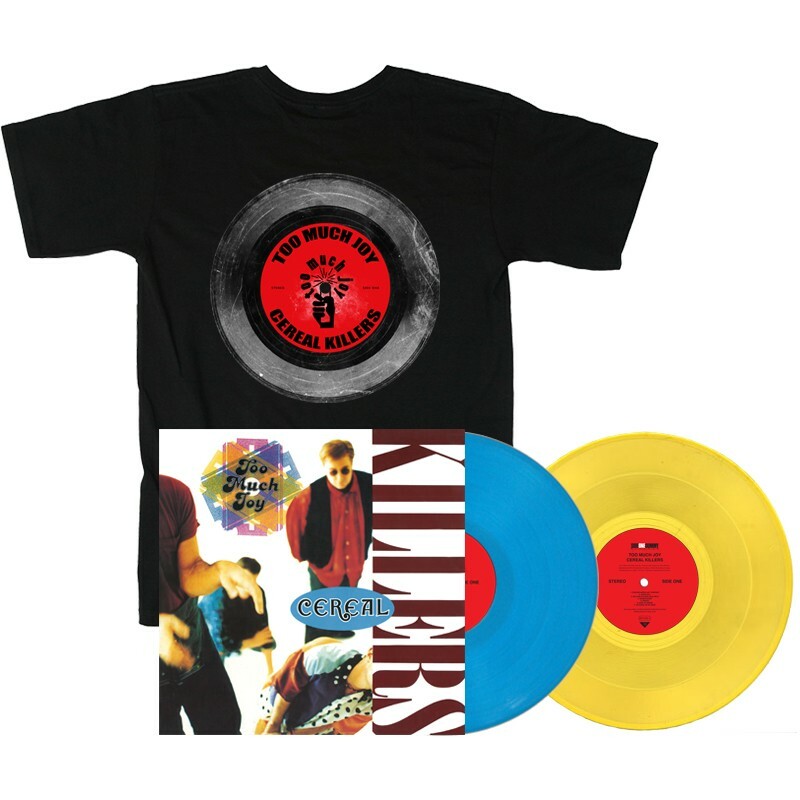 They’ll be performing a few songs, backed by Bonerama, the NOLA R&B band they’ve been working with on several songs for the next Wonderlick record. If you’re in town, you should come by the show, as the bill’s pretty stellar: it also includes Damian from OKGo, an even rarer live appearance by Jenny Toomey, Jonny 5 from Flobots, Rebecca Gates and some surprise guests we’re not allowed to pre-announce. More details, including how to buy special VIP passes that get you into soundcheck to hobnob with the artistes, can be found here. Today’s the official release date of Dear New Orleans, and you can hear the entire, epic benefit album right here. OK Go, Mike Mills from R.E.M., My Morning Jacket, Tom Morello from Rage Against the Machine, Bonnie ‘Prince’ Billy, Steve Earle, Allison Moorer, Jill Sobule, Flobots, the Wrens…do I really need to go on? I spent a good part of the summer helping my friends from Air Traffic Control pull together the Sandinista of benefit albums: Dear New Orleans features over 30 tracks from a wide array of indie, country, hip-hop, jazz and r&b artists, all doing songs dedicated to (and in some cases specifically about) one of our country’s most precious and musical cities. The album’s being released to mark the 5th anniversary of the flooding caused by the breaking of the levees after Katrina hit, and proceeds will go to the community organizations still helping to rebuild the city and preserve the wider Gulf area. That track is a new version of “The American Way,” complete with a brass band — multiple trombone parts were arranged by Mark Mullins from NOLA’s own Bonerama, and the Bonerama horns recorded their parts in New Orleans just a couple weeks ago. 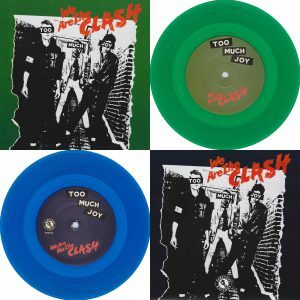 More details will be coming over the next week, including news about how to snag the triple album for the price of a 7″ single (really) the day before it comes out. 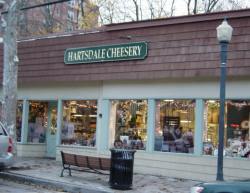 Too Much Joy were saddened by the news this week that the Hartsdale Cheesery has gone out of business. To pay tribute to this hometown institution (technically, it was an institution of the town next to TMJ’s hometown, or, if you were Tommy, who grew up in Eastchester, the town next to the town next to your hometown), we are naming “Pride of Frankenstein” our song of the week, as it is the only commercially released song we’re aware of ever to name check the Cheesery. Sadly, that may be the most notable fact about the tune. It’s not my proudest moment as a lyricist, and the arrangement is charitably described as busy, which may be why it was played live all of twice before being retired from the set. Some fans seemed to like it, though — one sent me a letter with an essay he’d written for a high school English class about the song. The dude the song’s about really existed, and really did used to wander around Scarsdale and Hartsdale writing down the license plate numbers of all the parked cars in a little notebook he carried around just for that purpose. The bit about throwing rocks at him is dramatic license — not that I never did anything cruel to sad figures when I was a kid; I just don’t remember throwing rocks at him, specifically. In a semi-related bit of trivia, one of the rare arguments I’ve had with my wife happened one night during a Scrabble game, when I scored a bingo playing “cheesery” using a Y that was already on the board. She challenged me. Turns out it’s not in the dictionary. And now it’s not in Hartsdale, either. I got something in the mail last week I’d been wanting for years: a Too Much Joy royalty statement from Warner Brothers that finally included our digital earnings. 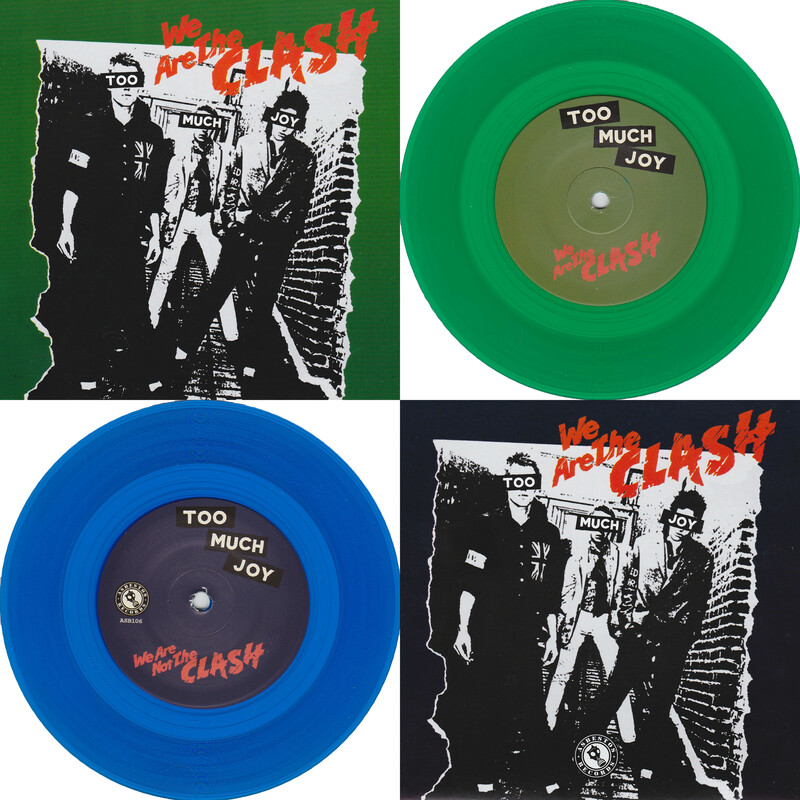 Though our catalog has been out of print physically since the late-1990s, the three albums we released on Giant/WB have been available digitally for about five years. Yet the royalty statements I received every six months kept insisting we had zero income, and our unrecouped balance ($395,277.18! )* stubbornly remained the same. Now, I don’t ever expect that unrecouped balance to turn into a positive number, but since the band had been seeing thousands of dollars in digital royalties each year from IODA for the four indie albums we control ourselves, I figured five years’ worth of digital income from our far more popular major label albums would at least make a small dent in the figure. Our IODA royalties during that time had totaled about $12,000 – not a princely sum, but enough to suggest that the total haul over the same period from our major label material should be at least that much, if not two to five times more. 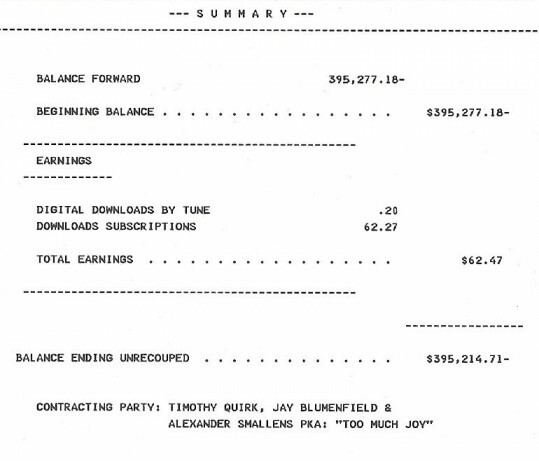 Even with the band receiving only a percentage of the major label take, getting our unrecouped balance below $375,000 seemed reasonable, and knocking it closer to -$350,000 wasn’t out of the question. I mean, we all know that major labels are supposed to be venal masters of hiding money from artists, but they’re also supposed to be good at it, right? This figure wasn’t insulting because it was so small, it was insulting because it was so stupid.